Castlebar punk rock trio Struck have just released their brand new official music video for the single ‘Going Away Rekindles Youth', which is taken from their current EP release entitled ‘Wake Up, Make Up'. Struck are excited to be able to release their second music video featuring the EP's standout track ‘Going Away Rekindles Youth'. Struck members Sean, Ger, and Jonathan say the record "means a lot to [them], it's about someone very close to [them] who moved away. Not only that, but it's about emigration in general as well." The song paints a familiar picture of having to say goodbye to someone you are close to, for better or worse. Struck have also just announced 2 special headline shows in Ireland this February, with shows in Galway (9th) and Dublin (16th). Struck originally formed as a school cover band a few years back in Castlebar, but since then they have released two EP's to date, with ‘Three Cheers for Lying' in 2010 and their new EP, ‘Wake up, Make Up'. 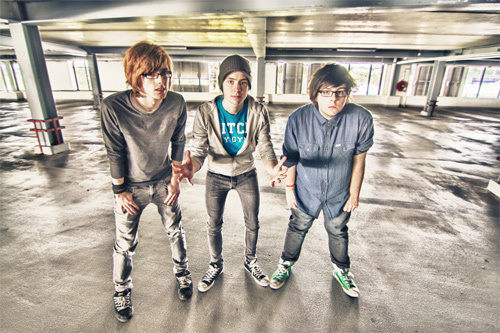 Made up of three members (Sean, Ger, and Jonathan) who have committed themselves entirely to the band, Struck have a sound reminiscent of the boys' musical influences, which include everything from Jimmy Eat World and Green Day to Katy Perry. In 2012, Struck completed their first two successful headline tours of Ireland playing in places such as Castlebar, Dublin, Cork, Limerick, Galway and Wexford. They have also shared the stage with acts like The Coronas, Rubberbandits and Keywest. The release of their EP in 2012 has received national media attention after being featured in The Daily Star and on radio stations such as Today FM & iRadio. Make sure you become a fan of Struck before the masses grip onto their every move!